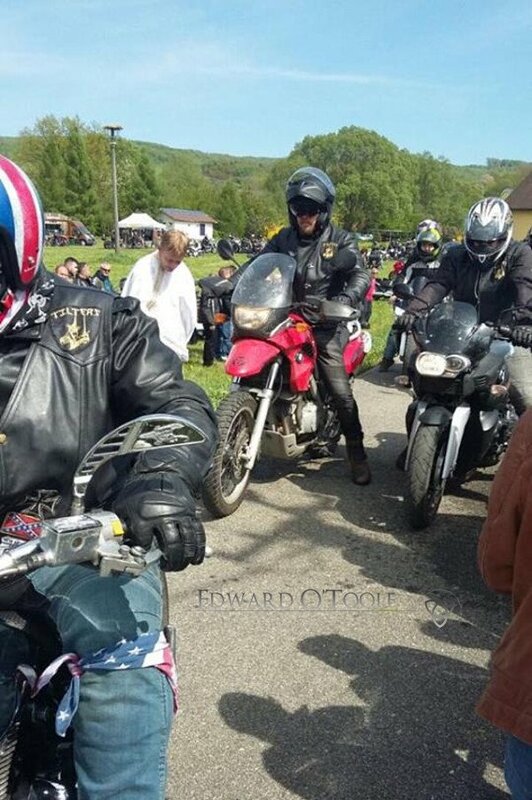 Last Saturday, 28th of April, my motorcycle club – Tilters Svidnik – headed out to Andy Warhol’s hometown, Medzilaborce, to join hundreds of other riders for the annual blessing at the start of the riding season. 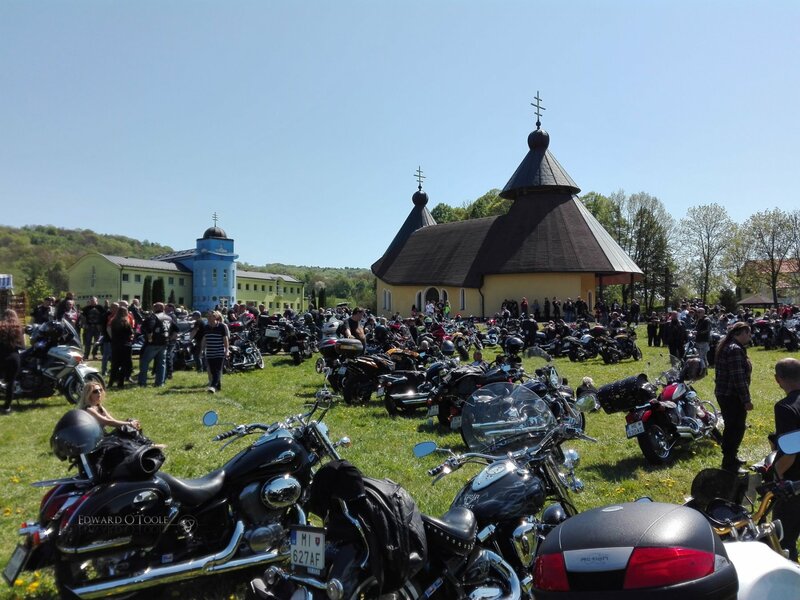 Close to the Ukraine border in the small Slovak village of Krasny Brod, bikers and motorcyclists from all over Eastern Slovakia and southern Poland gather to have their bikes blessed by Greek Orthodox priests before setting off on a group ride to Lake Domasa for a party. Saturday was boiling hot and really not the time to be wearing full black leathers. 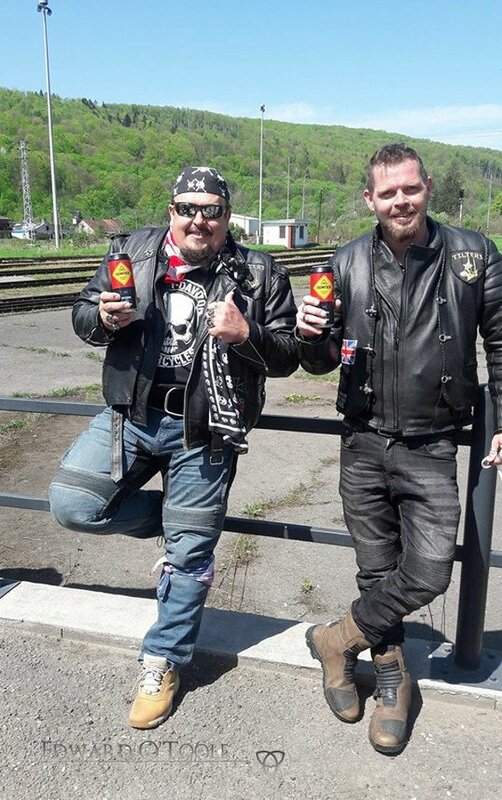 We stopped at a petrol station in Medzilaborce while we waited for some other members to meet us, and Mickey and I enjoyed a cold energy drink. Not everyone could attend as some had to work, plus Saturdays in Spring are when you do hard graft at home and it’s often quite difficult to explain to better-halves why riding with your club brothers is more important than mowing the lawn or tilling the soil. Last year was apparently 2 degrees Celsius and standing in a field for an hour had been hard going, as had the ride itself. This year it was 30 degrees, which meant it was hard going for the opposite reason but riding those remote bush roads under a blue sky and surrounded by thick green hills was amazing. It’s a beautiful part of the country which few venture to because it’s so out of the way. The only reason most visit is to see the Andy Warhol museum. The roads are twisty and winding and go up and down hills but they are quite resplendent with some deep holes to be avoided. 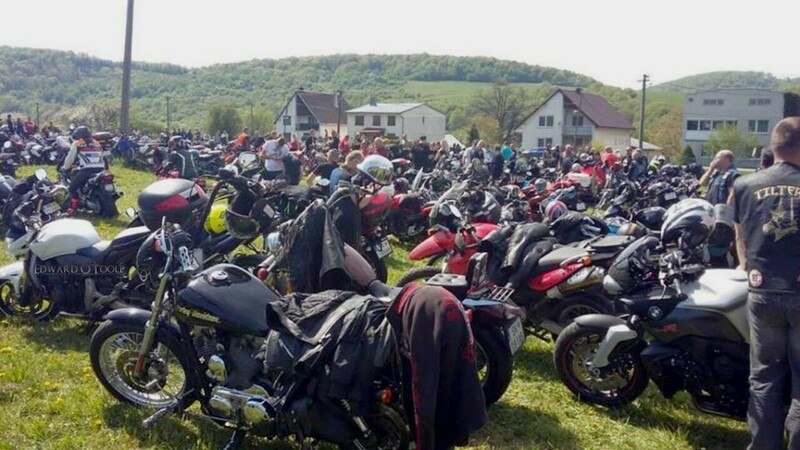 I was shocked at the sheer number of bikes (and their riders and pillions) there. There were a lot more than I’d expected. Unfortunately, i couldn’t avoid being sprinkled with water by the Byzantine priests as they stood at the exit to the field and caught everyone as they left. That’s me on Scarlet, my BMW F650GS. On the ride back, the rest of the club headed to Lake Domasa for the party and at Stropkov I left them and headed to my village house as I had some stuff to prepare for the evening. Scarlet limped back with some serious vibrations and I’m surprised I made it. I’d already been told by a few members that my sprocket had worn down and my chain was way too loose but I didn’t realize the full extent. I’ve since ordered a new transmission set (another little surprise expenditure this year) as that was really pushing my luck. I got back to the village and started preparing a fire outside while my wife cooked a wild boar goulash over it. Later that evening several members of the club dropped by to belatedly help me celebrate my 44th birthday. 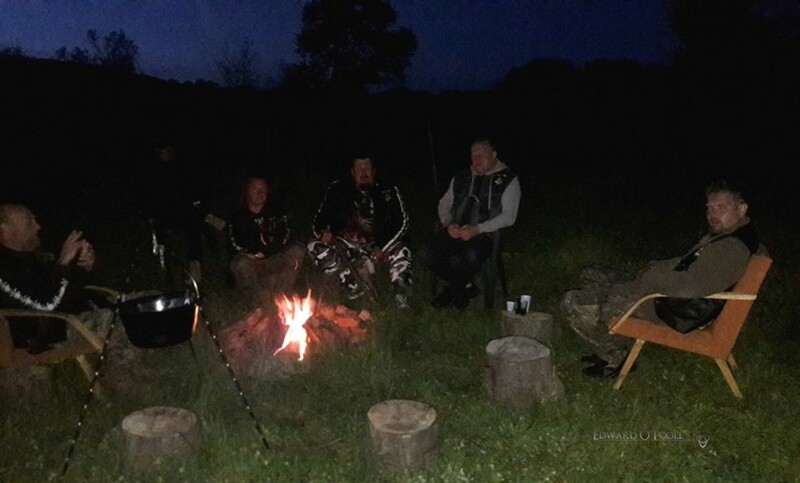 Thankfully, they brought their own bottle of Captain Morgan rum, which they happily consumed while the night time temperature began to plummet.